Don't forget your pet when you're making your family's favorite treats. 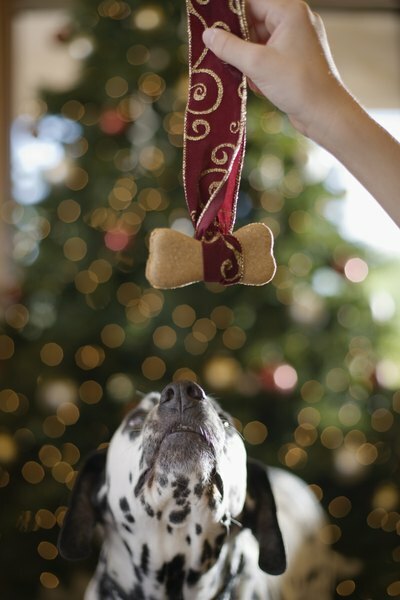 Your pup is an important member of your family, so it makes sense that he should eat like one. Making tasty and healthy pupcakes for your furry friend is simple and fun, although your dog might be a bit sad when you won't let him lick the bowl. Between work, family and friends, it's hard enough to find a few minutes to yourself—why should you spend them cooking for your dog? The answer is the same reason you should make homemade food for yourself: it's healthy. Many dog treats contain unhealthy additives or preservatives, and some use undesirable ingredients such as meat byproducts. Also, many dogs suffer from food allergies, and making your own treats means you can steer clear of potential food hazards. Spending a few minutes here and there to make your own dog treats allows you to control the ingredients. For basic dog treats with tasty applesauce and oatmeal, start with ingredients that are likely already in your pantry. You'll need 2 cups of barley, wheat or white flour and 2 tablespoons of olive oil. Gather 1/3 cup of unsweetened applesauce and 1/2 cup oatmeal—the real kind, not the instant kind. (It's often called old-fashioned oatmeal.) Mix it all together, adding up to 3 tablespoons of water if necessary to bring it all together into a dough. Roll it out to about half an inch thick, then cut out shapes with cookie cutters. Any shape will do, although your pup might enjoy the standard dog biscuit shape. Bake for 30 minutes at 350 degrees Fahrenheit. You and your dog might be anxious to give the treats a try, but be sure to wait until they're cool. If baking isn't really your thing, no need to stress out over making the treats every week. You can cook a bunch at once and store them in the freezer for up to six months, allowing thawed treats to stay in an airtight container for about two weeks at room temperature. Keep your pet interested in the treats by making them slightly different each time. Add 1/3 cup cheddar cheese and 1/4 grated Parmesan cheese for a treat he won't be able to resist. A touch of cinnamon can help get you and Fido in the holiday spirit, while a cup of dried apple chips can give the treats a crunchy twist. You can also try a dash of vanilla or a couple of tablespoons of honey to see what flavors your dog seems to like the best. Sprinkle in some powdered ginger, about 1 teaspoon, before you travel to help prevent motion sickness in your pup.